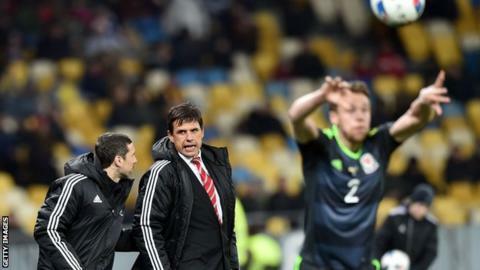 Wales manager Chris Coleman believes simply reaching Euro 2016 will not be enough for Welsh football. Coleman will lead Wales at their first major tournament for 58 years in just over 50 days time when the country's European Championship campaign kicks off against Slovakia in Bordeaux. "Qualification must not be a one-off," said Coleman. "If it is, then we haven't done our job properly. "Psychologically we've broken that barrier by qualifying." Coleman, who is yet to agree a new deal to remain as national team coach beyond the summer, wants the next generation of Welsh player to be inspired by events in France. "Everyone has dreamt about going to a tournament, but now we're in a place of power we've got to capitalise on it," he explained. "The next generation is obviously going to come from grass roots, so the key is how do you cut through the levels and produce better coaches and better players." Wales have not graced a major finals since John Charles and company qualified for the 1958 World Cup in Sweden. That long wait will end in France this summer with England, Slovakia and Russia their group opponents, but Coleman insists Euro 2016 must represent the start for Wales and not the end of the process. "In one way it's a dangerous place where we are," said Coleman. "We've got a great opportunity to push this forward and really take it on, and rather than us qualifying once every 50 years we should be doing it a lot more. "What we've got to do from here is achieve back-to-back qualifications, two out of three, three out of five. "We've got to be up there consistently punching and producing good young players to fit into the system. "Not doing it for so long has left a mark, but we've got over that now and the challenge in future will be to qualify again." Coleman also reserved special praise for Gareth Bale, saying his talisman is a role model for children. "Everybody looks to Gareth Bale and rightly so because he is a great player," he said. "But it's not just what he does on the pitch, it's how he is as a sportsman. "He's a role model but we've also tried to create a culture with this Welsh team, a pressure to represent your country properly. "We challenge them because we know these young children are watching us. "Gareth Bale is at Real Madrid, but he's a great example of that culture."